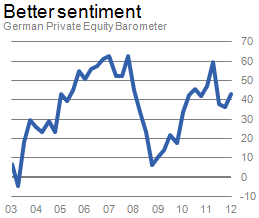 The Q1 German Private Equity Barometer reports better sentiment: The business climate index rose 6.8 points and is now above its long-term average. The improvement is mostly driven by better expectations (+12.9 points) and more upbeat early-stage investors (+14.8 points). European high-yield spreads, which are an important indicator of private-equity investments, dropped 25% in Q1. Hence, better spirits among German private equiteers were to be expected. However, the rise in overall expectations should be treated with caution: the expectation indicator has a tendency of overshooting the current business climate. Bear in mind that European high-yield spreads rose 5% again in April – pointing towards a more challenging environment. The improvement in the early-stage segment, which usually depends less on easy credit, is a much more interesting observation. Respondents noted better fundraising conditions (from a very low level) and expect stronger demand for venture capital from high-tech start-ups.